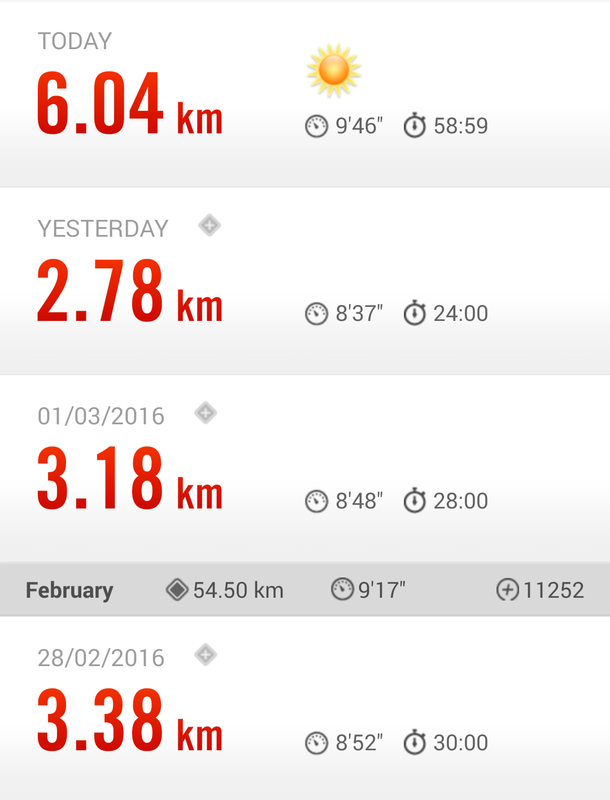 I alternated between 6 km/h and 7.2 km/h. I managed to do the first 10 minutes without slowing down but I struggled with the second run. I reduced the speed to 6.8 km/h a couple of times, but for no more than 30 seconds each time, just so I could catch my breath. I was so happy when it was over! I keep reading conflicting information about how to breathe while running. Some articles say it’s best to breathe through the mouth so then your jaw is more relaxed, while others say that breathing through your mouth causes your throat to become dry and you’ll need to keep drinking water… Which is best?? The ‘prisoner bends’ are basically side bends, but kneeling on a bench with my hands behind my head (as if I was doing a situp). I did some stretches after that and was done for the day. Again, I managed the first run without slowing down and found the second one utter torture. I slowed down a couple of times, but not for long… but I managed to do it. I didn’t press the ‘stop’ button as soon as I’d finished the 400 m – I walked for about 20-30 seconds until I got to 1 km. I did the 1 km in 8 min 48 s. Pete said he wanted to get that time down to 7 min over the next few weeks. This should be interesting! I was done after that. I did a few stretches and went home. On Thursday morning I went to a Hatha Flow class at Eco Yoga Sanctuary. When I signed in I noticed a few names above mine – there are usually only one or two other people in the class – and by the time the class started, we were 10 in total. Where had all these women come from? It was the highest number of people I’d seen in any class there. It was a really good class though – focusing on hip openers and legs. It was just what I needed after spending all that time on the treadmill. Just as I got to minute 4 of my warmup, the other treadmill became free so I moved over. I did a further minute of my warmup and began with the run. I managed to do the 15-minute run, I slowed down twice but not for longer than 30 s – and I did the last 5-minute run without stopping. This was the furthest I’d come with the 10k Runner app – and I never imagined I’d be able to run (or shuffle) for 15 minutes at a stretch! Low point of the week? My knees have started aching – I’m not sure why. They were quite sore on Saturday evening. High point of the week? I did seven workouts this week, including the 1-hour walk on the beach. I also had a very quiet weekend – no drinks, no junk food. All my pajama bottoms are loose for me – unless the elastic is gone in all of them! Weight loss? 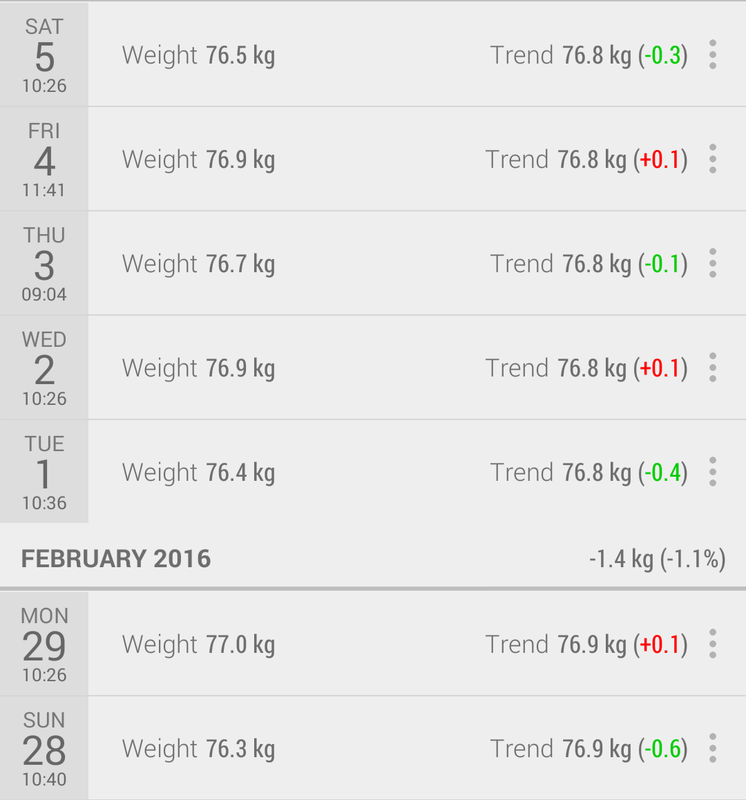 I seem to be stuck at 76 kg, and according to the Libra weight-tracking app, I’ll hit my goal weight of 65 kg in July 2017.